PokÃ©mon has always scratched that mobile monster-collecting itch perfectly, and fans eagerly gobble up each release as it hits store shelves. Like clockwork, a new PokÃ©mon installment drops, and gamers eat it up like hungry Snorlaxes. This year, a new franchise has entered the ring, one that's already massively popular in Japan and juggling manga, anime, movie, and other media franchises. 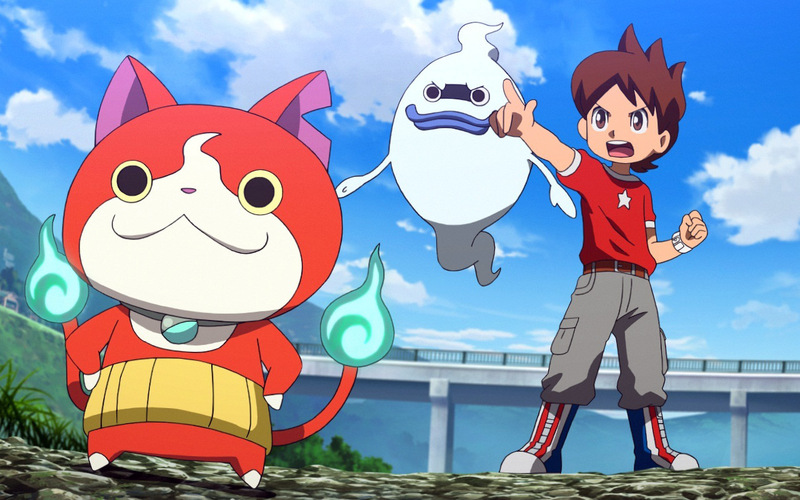 It's called Yo-Kai Watch, and it's poised to hit Western audiences just as hard. The first game in the series is debuting this week for Nintendo 3DS, but is it worth adding to your collection? Yo-Kai Watch's premise is simple. You can choose a male or female protagonist who happens upon a bizarre game machine one day in the forest (a "Crank-a-Kai," to be exact) in which a spirit named Whisper is hiding. Whisper gifts your character with the Yo-Kai Watch, a special device that allows him or her to see Yo-Kai that are hidden in the world. Like PokÃ©mon, which gamers will draw obvious comparisons to, there are different elements and types of Yo-Kai, as well as evolutionary stages and aesthetic. Some look like humans, some resemble ducks with rivers of snot running from their noses, and some look like enormous mud piles. There's a ton of colorful characters to choose from, and they're hiding under cars, in trees, and even in plain sight as shopkeepers. It's your job to find them and bring them into your fold. Once you befriend a Yo-Kai, you'll earn a medal to place in your Yo-Kai Medallium, where all of your collection is stored. Sometimes after you engage in battle with Yo-Kai, they'll approach you to see if you want to be friends. If you accept, they'll be added to your collection and available to swap in and out of battle. Scanning takes up a good portion of the gameplay, as you'll have to scan for Yo-Kai to grind with if you're not hanging around special dungeon areas, so it can wear on the nerves as you look around for spirits to battle with, especially as you can't do it while walking. But it's a fun mechanic that's rewarding when you find new creatures, and often the crux of certain puzzles. Combat in Yo-Kai Watch is the most peculiar aspect of the game, especially since you don't directly control the actions of your party. Instead you have a small scroll wheel controlled by the stylus where you shift around the six monsters in your party for three to engage in battle at a time. It can take a while to get used to, especially since you're forced to "purify" monsters by sending them to the back of your dial and completing quick mini games (clear all the fog from the screen, tap until you break glass, etc.) to get them cleared of the "Inspirit" status. You pull off special attacks in this way as well, launching offensives against enemies in waves as your Yo-Kai become available one by one. You can also pin targets for the party to single out and target, and use items in between the madness. It's all-out bedlam, and you'll feel frustrated at the beginning, but you do begin to acclimate yourself after the first few rounds. It's surprisingly deep and challenging for a game many will assume is meant mainly for children, and that's part of its charm. Unfortunately, this does mean you will end up losing several battles here and there, especially since you can't choose whether or not Yo-Kai X will strike exactly when you need it to. You'll traipse along a fairly large overworld in order to collect Yo-Kai, and there are tons of places to search to find them. It's not exactly a bustling area, but there are several shops for you to investigate and plenty of areas to head into if you need supplies and more. It's an expansive urban area to bite into, and there are tons of different NPCs to speak with and perform "favors" and other missions for. Yo-Kai Watch is a combination of several elements that make it a surprise success, but in some ways it's a step back as well. The narrative, while well-written, is simplistic and devoid of substance in some areas, and for those looking for a meaty tale to dig into, they'll find it lacking. The decision to market the license toward children is responsible for some of the "easier" phrasing and situations that crop up, and it's obvious some of them were created with kids in mind. But even with these pitfalls, it's not difficult to get involved or become engaged with the characters and world around you. Yo-Kai Watch is a curious role-playing game with more childish overtones and a ton of different Yo-Kai to collect. It's a fantastic game to pick up for handheld gamers and younger gamers alike with a challenging mix of battle mechanics and collecting that'll speak to a number of different players. If you're interested in seeing what all the hubbub's about, don't be afraid to reach out and give it a try, especially if you're wondering what all the hype is about.